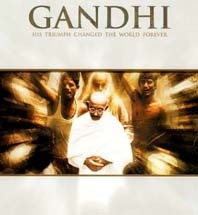 Sweeping account of the simple lawyer from South Africa, Mahatma Gandhi (Kingsley), who became the spiritual and political leader of India until his assassination in 1948. Sir Richard Attenborough (who also won the Oscar for direction). With John Gielgud, Martin Sheen, Candice Bergen, Trevor Howard, Edward Fox, John Mills, Roshan Seth, Ian Charleson, Rohini Hattangandy, Athal Fugard, and Saeed Jaffrey. Sir Richard Attenborough (1923 - ) British character actor who went on to produce and direct. His other producing credits include: THE LEAGUE OF GENTLEMEN, SEANCE ON A WET AFTERNOON, and OH WHAT A LOVELY WAR. John Briley received the Screenplay Oscar. Billy Williams and Ronnie Taylor shared the Oscar for Cinematography. The Art Direction Oscar was shared by Stuart Craig, Bob Laing, and Michael Seirton. John Bloom won the Editing Oscar.